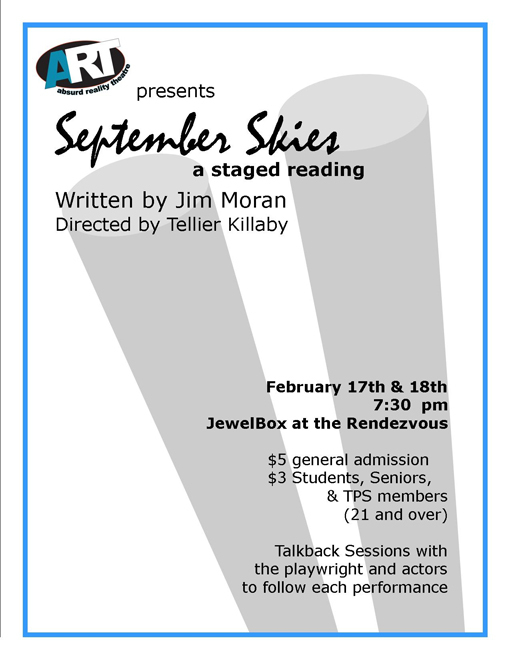 Absurd Reality Theatre is proud to present a staged reading of local playwright Jim Moran's September Skies on February 17th and 18th. September Skies is a one act play by local playwright Jim Moran that examines the effects of a happenstance meeting between two travelers who find themselves stuck in an airport. Each one is adrift...both physically and metaphorically. ART's production of September Skies will be in a staged reading format. Talkback sessions with the director, writer, and cast will follow both performances.